Do you love to have fun? Can you lead a group, make everyone feel at ease (especially around sharp steel), and create an amazing experience that guests will remember forever? Are you a natural at being the life of the party? If you responded “yes” to all three of these questions, you’re well on your way to becoming a badass axe throwing coach at Bad Axe Throwing Chicago! We’re looking for outgoing individuals who love helping people, challenging them to bring their A-game, and creating incredible memories that our guests will remember for the rest of their lives. 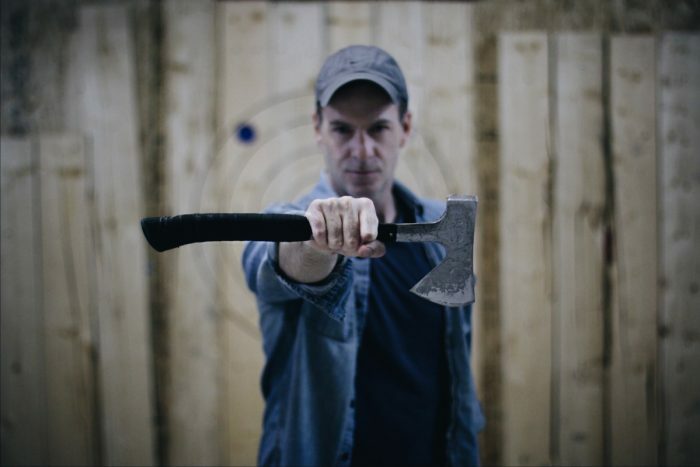 We don’t require any previous axe throwing experience because, for us, it’s all about the right attitude and mindset. When you join the Bad Axe Throwing Team, you don’t just join a company—you join a solid family of awesome people. Although our locations are spread across Canada and the US, we’re a close-knit team who communicates with each other and fosters a fun, synergetic environment. This is a part-time position with a flexible schedule. We’ll provide a paid training program that will give you the skills to succeed. You get a chance to learn from industry leaders in the entertainment/hospitality industry and sell FUN! Coordinate and prepare for a variety of events (birthday parties, corporate team-building events, bachelor parties, etc.). Meet and greet guests upon arrival and conduct a “welcome” introduction. Collect and process all customer payments. Conduct informative and energetic orientation. Get guests excited, energized and ready to have a great time! Responsible for organizing and engaging party guests through interactive games and tournaments (training will be provided). Engages with each guests throughout event to ensure a personalized service is provided. Supports the execution of internal and external promotions and marketing campaigns. Establishes relationships with local businesses and create brand awareness of our company. Maintains regular communication via phone and email with the management team and the customer service team. 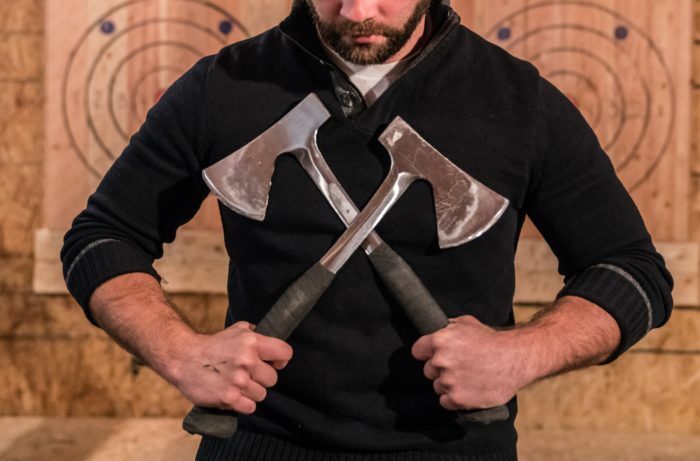 Like we said, you don’t need any previous axe throwing experience, but we do require some customer service experience. We ask that you have a passion for leading groups and that you can speak the language of fun to all who walk through those Bad Axe doors. If you can cater to anyone, regardless of age and background, and provide an unforgettable experience, then you’ve done your job. You are upbeat, outgoing, professional and well spoken. You are comfortable speaking on the phone and through email communication. You enjoy engaging with guests and being creative. You are able to create an environment that breathes fun. You possess strong communication, interpersonal, organizational and time management skills. You are motivated and driven. You think on your feet. You like learning new things and you learn quickly. When things change, you can roll with the punches. You are able to use a smartphone (Android/Apple) with ease. You are going to take ownership of the time you spend with us and truly make a difference! You have a flexible schedule and are available on weekends and weekday evenings. Pay is $15/hour + tips. 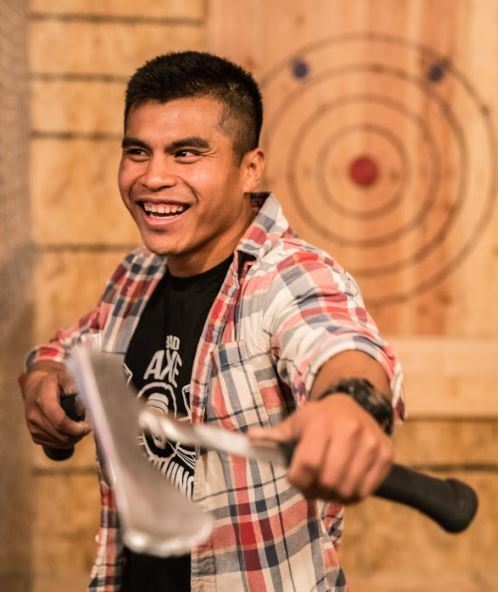 Bad Axe Throwing is an event-based company that offers fun and thrilling experiences to all humans looking for a memorable time. From birthday parties to bachelor & bachelorette parties to corporate events and no-need-for-a-reason-to-celebrate groups, we cater to everybody. We first opened our doors in Burlington in 2014 and since then have opened multiple locations across Canada and the U.S. We’re Canadian-based and we enjoy wearing plaid (but we don’t make it a mandatory uniform). Step out of the ordinary and come to the edge—apply now by emailing us or by visiting our job board.